He did say, in this speech, that at least some Christians are part of the problem (and praised others who are part of the solution.) He has done some things to rein in some of the craziest, like getting them out of sensitive positions and back to Rome. He has taken steps to make it easier to identify and convict priest pedophiles. He's only the Pope, not God. He can't do everything at once. Really! He should start with his Vatican first. Noted. Thanks, Darren. 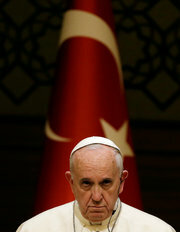 Although I left the Catholic church years ago, I can't help but smile when I see the face of this Pope. Yes---as Joanne Dixon stated; he is trying his best. He has removed high-ranking Cardinals who were playing politics. I even read that a few weeks ago, members of his own family were killed in an accident. He is the antithesis of the previous pope; making statements and acting in opposition of Benedict's papacy. I wish him a long and healthy life. is it really possible to have a dialogue with people who are ready to blow themselves up in front of those they consider as "kufars" ? Roger is right. It's totally impossible to have any dialogue with Islamist maniacs. Francis means well but doesn't understand what the world is up against. Don't you mean that Erdogan is full of wind, Walter? After all his forebears discovered America.